Serve with a white blend. Preheat oven to 220C and roast red peppers for about 30 minutes or until blackened. Remove from oven and place blackened peppers into a glass bowl and cover with plastic wrap, allowing them to sweat. Once cool enough to handle, gently peel the blackened skin from the peppers and discard. Place halloumi and asparagus onto a plate, season with salt and freshly ground pepper and toss with a little olive oil. Heat a grill pan until hot and grill cheese and asparagus for a few minutes until cheese is slightly charred and asparagus is just cooked. Remove and place in a bowl together with the chickpeas. Add chopped parsley, lemon juice and pesto and toss to combine. Season with salt and freshly ground pepper and arrange neatly onto a platter.Garnish with wild rocket and serve immediately. 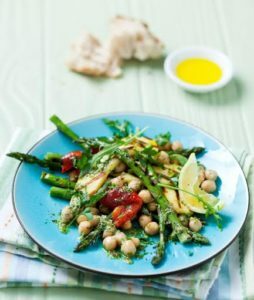 This salad offers some powerful, earthy flavours so you need a white wine of suitable flavour intensity to pair with it – we would suggest either a Sauvignon Blanc-Semillon blend or one of the many excellent Chenin-based blends out there, both categories of wine typically having enough body and acidity to cope.